Four copies of an extended todo list on an A4 size paper in a vertical, portrait orientation. 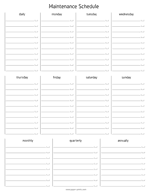 Weekly schedule with all weekdays on an A4 size paper in a horizontal, landscape orientation. Weekly schedule with all weekdays on a letter size paper in a horizontal, landscape orientation. 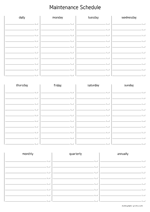 Weekly schedule with all weekdays on an A4 size paper in a horizontal, landscape orientation. This version has a weekstart on sunday. Weekly schedule with all weekdays on a letter size paper in a horizontal, landscape orientation. This version has a weekstart on sunday. 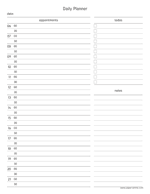 Maintenance or service schedule on an A4 size paper in a vertical, portrait orientation. 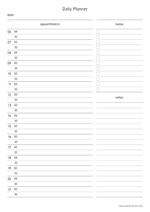 This sheet includes weekdays, month, quaterly and annual items. 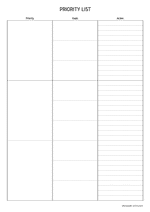 Maintenance or service schedule on a letter size paper in a vertical, portrait orientation. 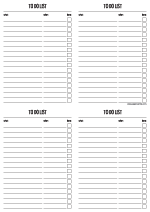 This sheet includes weekdays, month, quaterly and annual items. Priority list on an A4 size paper in a vertical, portrait orientation. 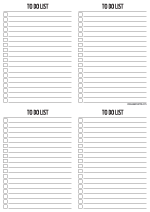 Order the most important things and list how to get them done.